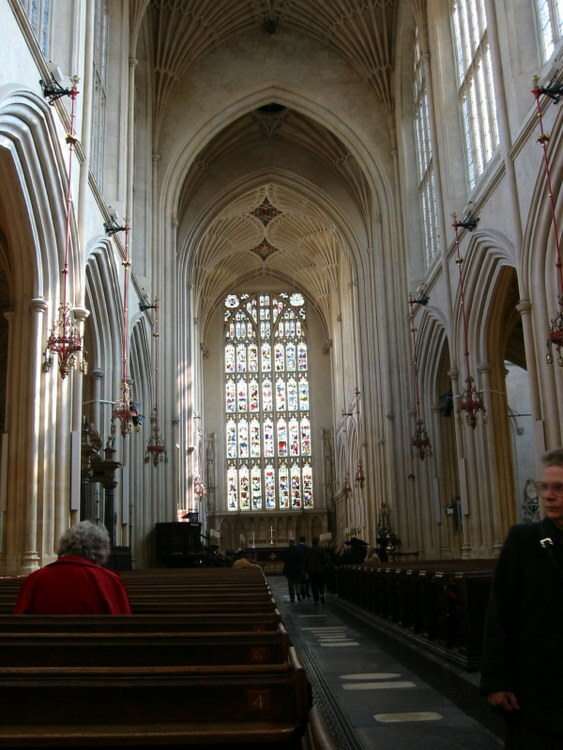 After an excellent breakfast buffet in the Pratt’s Hotel, we walked several blocks to Bath Abbey. We had been graciously assigned our own personal docent, Michael Adams. 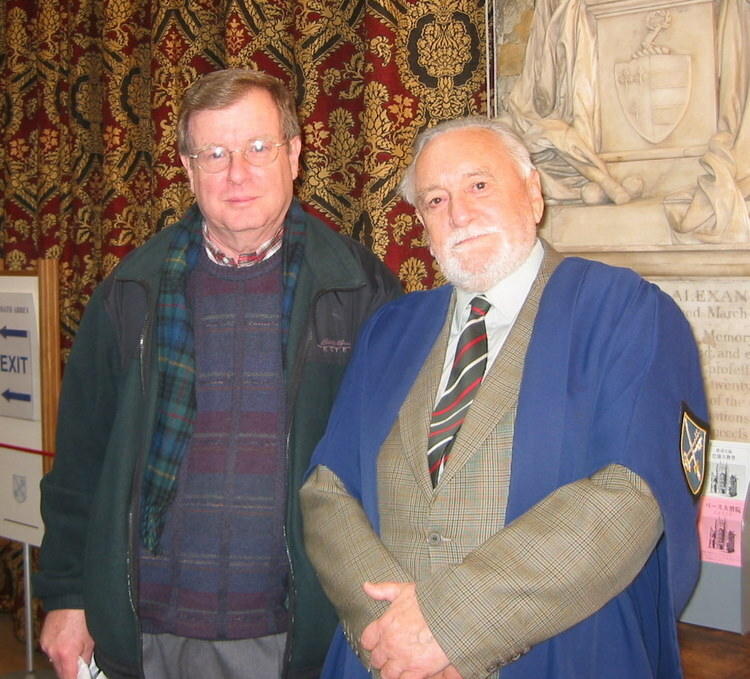 He gave us an very informative introduction to the history of Bath and the Abbey. A special tour of the crypt revealed a lot of interesting history. A little more history. 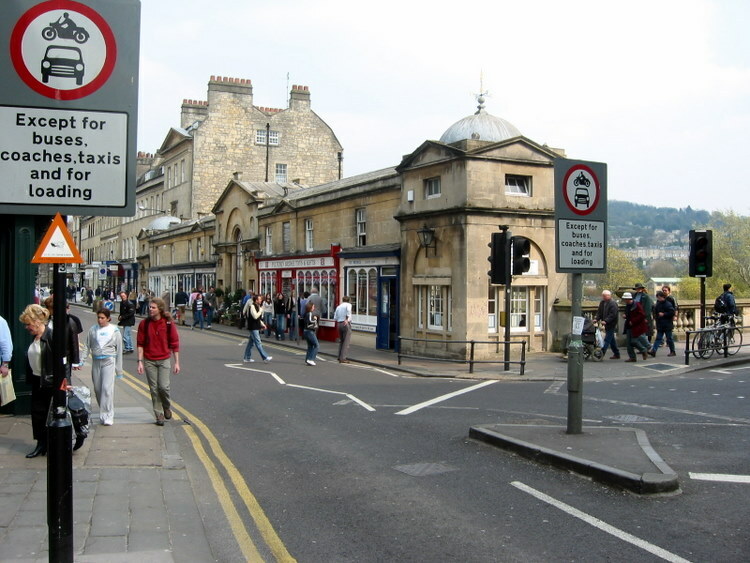 There were Christians in Bath around 350 – before Augustine brought Roman Christianity to England in 597. 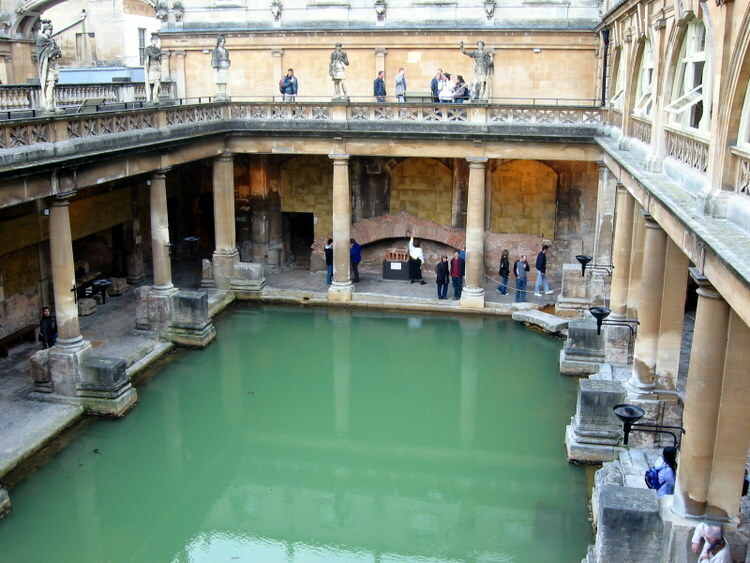 The Romans began to leave Bath about 400. In 675, a lady missionary, Bertana from Frankia gave land to found a Convent of Holy Virgins. 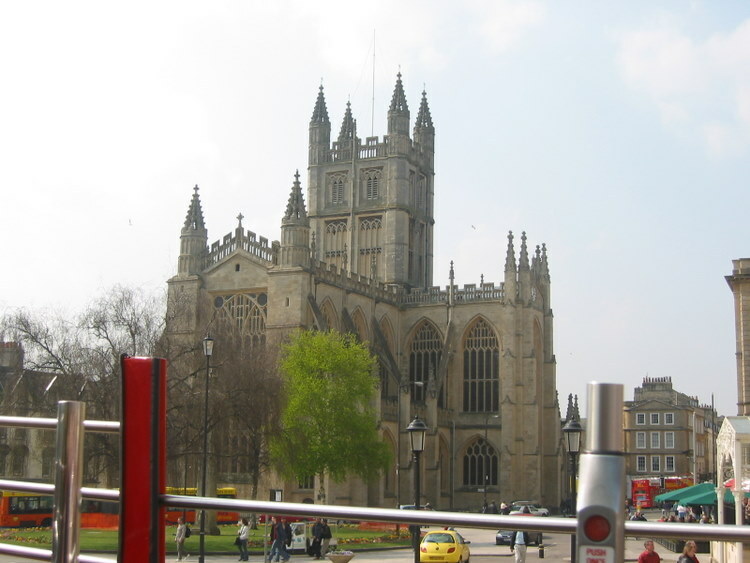 A charter in 757 granted land to brothers at the monastery of St. Peter at Bath. In 1088, John de Tours, Bishop of Wells moved to Bath because of the healing waters. He built the cathedral there which he envisioned as the largest cathedral in England. Work was begun in 1090. John de Tours died in 1122 and the work on the cathedral was not completed until 1170. By the year 1245, Bath’s importance declined and Wells once again became the site of the cathedral. 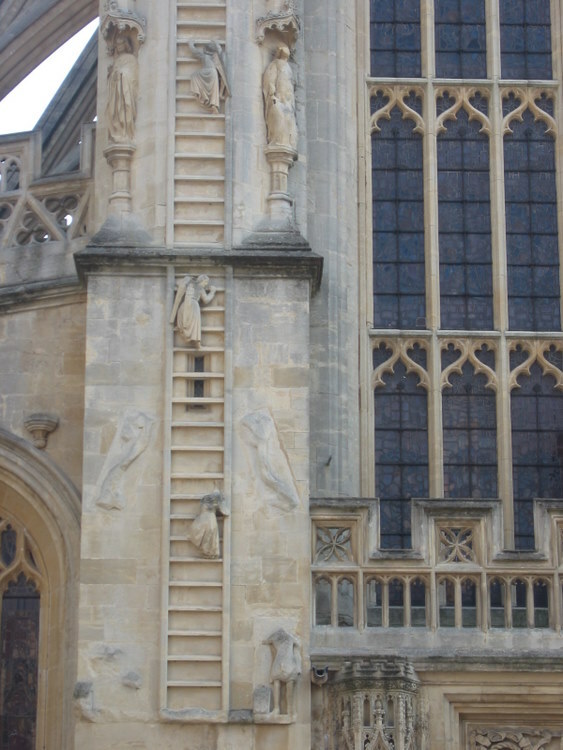 Bath’s monastery was home to about 40 monks , half of whom died during the 1348 Black Death. The abbey fell into ruins. 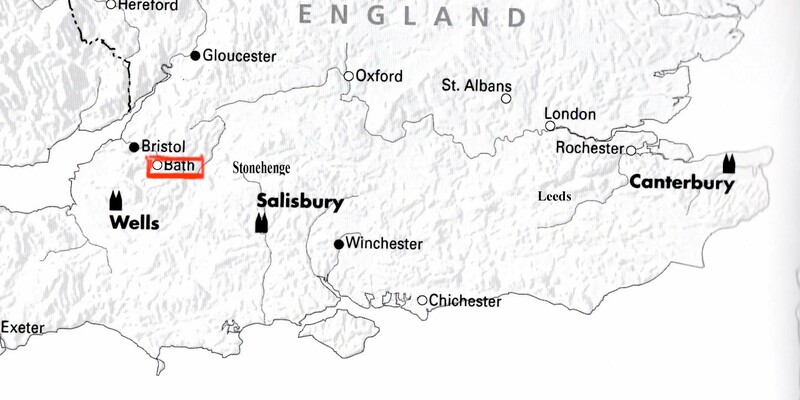 In 1499 Oliver King begins to plan for a new Abbey Church. He had a dream about the Heavenly Hosts ascending and descending a ladder. Oliver King had been a highly placed official at court but was imprisoned by order of King Richard III on supporting the cause of Henry Tudor. In 1485 Henry defeated Richard and succeeded him at King Henry VII and restored Oliver King to his position of Chief Secretary. The new Abbey was restored in the 16th century. What impressed us was the openness and lightness of the Abbey Church. At the east end over the altar is a magnificent Victorian stained glass window which depicts 56 events in Jesus’ life. This window was partly destroyed by a landmine explosion during the air raids of 1942. They are completely restored. There were a number of beautiful stained glass windows; however, in the clerestory in the nave the windows were clear glass. From the outside you could see all the way through the abbey. There are total of 52 windows in the entire church. 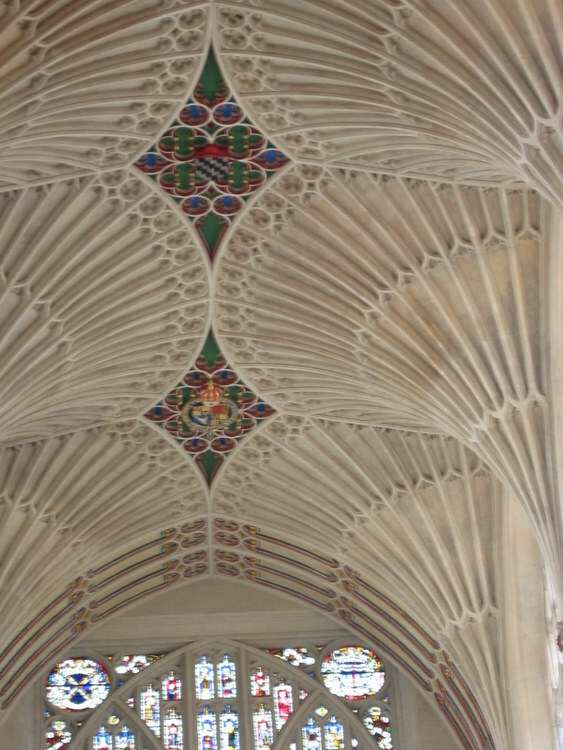 The ceiling is all beautiful fan vaulting. On the wall on the right side of the Nave is a large bronze plaque listing the names of all the abbots. It is interesting to see how the names change through the ages from Saxon to Norman. 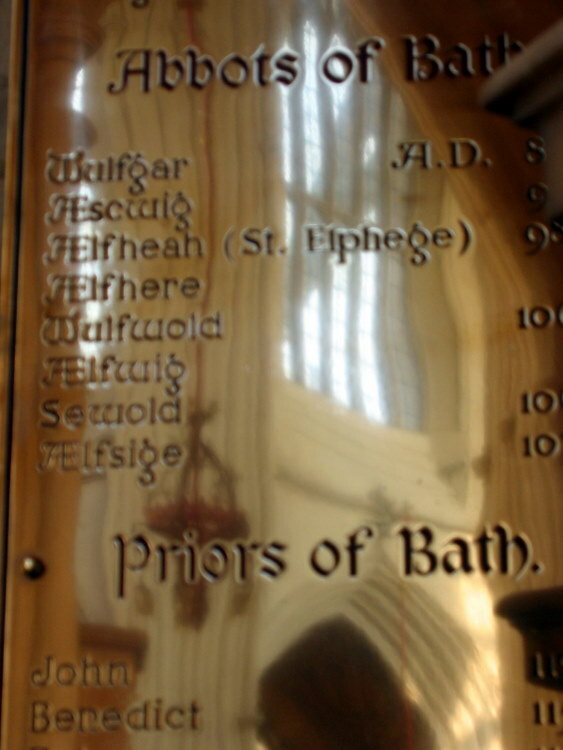 The names start as Wulfgar 856, Heifheah, Sewold then by 1191 we find names like John, Peter, Thomas, Robert and Hugh. Michael Adams gave a long and detailed tour, we were impressed. A side note- on Sunday we saw a poster sized chart showing the linage of English Kings and Queens in a store window but the store was closed on Sunday. On returning home, we emailed Mr. Adams and asked him to please purchase for us when he had time- the store was just outside of the cathedral. Within a short time he sent us the chart as a gift. We have it framed and hanging in our hallway along with similar charts of Spanish and French Royalty. After visiting Beth Abbey, we boarded a sightseeing bus. We were able to ride on the top deck; however, one set of ear phones didn’t work so one of us missed some of the detail. We went past The Royal Crescent which is one of the world’s architectural masterpieces designed by John Wood the younger. We came back to the Abbey and had lunch on the square by the Abbey and the Roman Baths. This was a very lively street with several entertainers. After lunch we walked across the Pulteney Bridge which is one of the most beautiful and romantic bridges in the world and is one of only a handful of historic bridges which has shops built into it. Near the bridge we stopped in Rossiters of Bath where we bought “bunny and duckling” plates and a “bunny” mug. We didn’t have little grandchildren at the time. We now have two little people who use these plates on special occasions. We went back to the square to explore the ROMAN BATH ( see Model ) which have a very long history. After the dissolution of the monastery in 1539 the King’s Bath eventually came into the hands of the City Corporation. In the 16th century the Queen’s Bath was built on the south side. 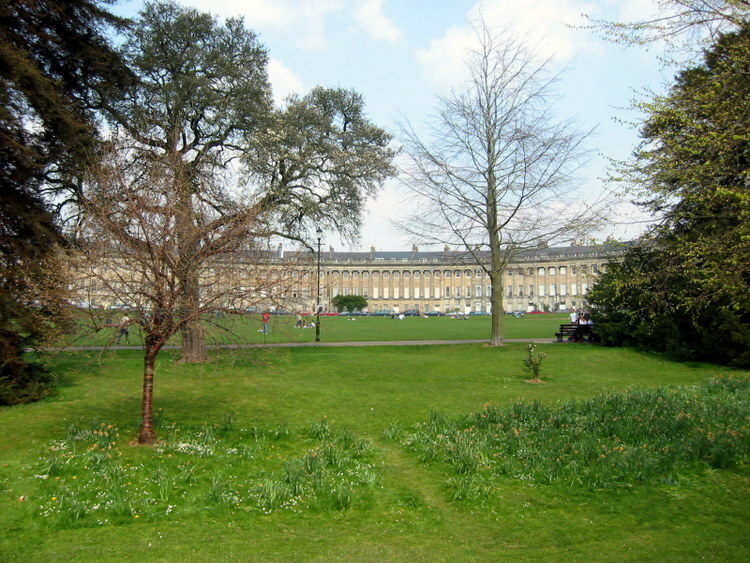 Throughout the 17th century Bath became increasingly popular as a spa resort. Some of the medieval bathing niches are still visible on the far side of the bath. In 1704 the first Pump Room was built on the north side of the King’s Bath. Spa water for drinking was pumped up to it from the spring below. The present larger building was erected in 1790, partly covering the north side of the King’s Bath. The statue of Prince Bladud, legendary founder of Bath is still to be seen today. The bath was used regularly for bathing until 1939. In 1979 its floor was removed for structural reasons and the water lowered to its present level; the orange stain indicates the former water level. Architecture from several different periods can be seen; the wall on the right below the balustrade is Roman and the bathing niches on the far side which once lined all four walls are medieval. After stopping in a “real pub”, we went back to the Pratt’s Hotel where we had an enjoyable dinner. I had a pork stroganoff with a brie and bacon tartlet. My wife had a delicious salmon and a tartlet of pecans and apples.